I constantly, mention to you, what a very detailed, indepth and well written review that you have written here at Coleman's Corner in Cinema whenever I visit your blog and read your review...Why? Because I really feel that way about your writing. 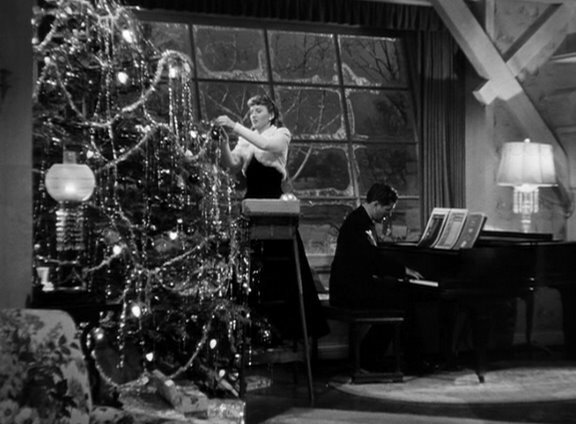 Ahhh!...and you have not miss a "beat" when it comes to your very detailed review of the 1945 film..."Christmas in Connecticut" a yuletide film that I watch every year when the holiday season(s) roll around. As a matter of fact, I plan to watch it again today as I wrap up X-mas gifts. This is my first "Christmas" post as an (e)blogger in the bloggisphere (and just like my 2 previous post at...Halloween and Thanksgiving) I want to "wish" you and your family (The Coleman Family) and the "posters" who(m) leave comment here at Coleman's Corner in Cinema a Very Merry Christmas and a Happy New Year! Alexander said,"Playing an impostor posing as the perfect housewife and chef, her performance partly looks forward to Martha Stewart and Rachel Ray in this time period as well as women who offered delicious recipes for women magazines such as Stanwyck's fraud, Elizabeth Lane." Thank you so much for the continual support and kind words, Dark City Dame (or should I call you Noirish Dame these days?). Thank you for the wishing of a Merry Christmas from you, to all who stop by Coleman's Corner as well as I.
I can't imagine a better film during which one can wrap up Christmas gifts. It is a tender holiday film. And as the Dark City Noirish Dame, I'm sure you love Barbara Stanwyck in this and other pictures. This Christmas time celebration of Barbra Stanwyck (an actress Alexander Coleman has exressed effusive passion for in past reviews, and one recent one in particular)seems altogether fitting, with this holiday staple, that I share your love for. Yes, indeed, it's amazing to consider how she could so easily glide for "venemous" and "unyielding feminine harshness" roles like DOUBLE INDEMNITY and the two you aptly name here (THE LADY EVE and MEET JOHN DOE) into the "opulent" comedic performances like this timeless chestnut, set with (as you rightly note) "familial warmth" in a Connecticut barn. And you are right-on, methinks tio issue praise for the seamless direction of the film. Your effervescent love of cinema's small-scale classics and your talent in conveying that infectious enthusiasm is simply something every blogger should avail himself/herself of. Merry christmas, especially to those who live in Connecticut. Thank you, Sam, for the very kind words. Yes, I am indeed quite the champion for Barbara Stanwyck, as you have noticed. This is a heartwarming semi-classic film, and it should be seen by anyone who is either already in the holiday mood or needs to get in it! Thank you again.